Today I’m going to make a confession. I’m going to tell you something deep, dark, and secret about myself – something that many of us probably have in common, but we just don’t like to talk about it. So, this is between you and me. Don’t spread it around. We’ll just keep it between us, ok? When it comes to embroidery, I am an over-optimist – and my optimism gets me into trouble. I am an optimist about time; I am an optimist about workload; I am an optimist about perseverance; I am an optimist about capabilities. And so, with my usual optimism, I often take on more than I can reasonably accomplish in a given amount of time, or I make plans that take me much longer to deliver on. 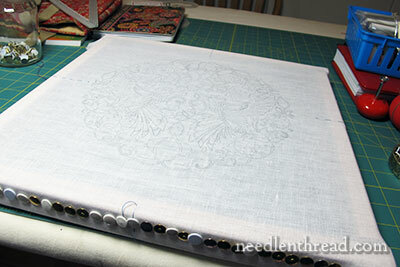 Take, for example, the Secret Garden embroidery project that I’m still slogging through, slowly but surely. I imagined this project would take about two months – despite writing articles every day for the website, doing regular website maintenance, keeping up with the daily round of email, working on other pressing projects for you (like this stitch sampler alphabet e-book), preparing online class materials… and so forth. I call it SOS – Stitching Optimism Syndrome – and it strikes more often than I like to admit. I knew shortly after beginning the Secret Garden project that I had fallen victim to the SOS lure once again. Not only had I undertaken the cotton version of the project, but I had mentioned doing a whitework version and a silk version, too! Right before embarking on a 2,500-mile road trip around the mid-section of my country a couple weeks, I set up the next Secret Garden undertaking – the same project done in various whitework techniques. And as I drove those 2,500 miles, I had a lot of thinking time. And I found myself dissecting the project – breaking it down into excerpts in my head. Then I started thinking about the silk version of the same project. And I started picturing other designs in the Secret Garden book. And by the time I got home, I had a whole new approach in mind. Something a little more… reasonable, shall we say? With the whitework version, I could work excerpts of the hummingbird project, to give folks a taste of what could be done with whitework on the same project. With the silk version, an excerpt of a different design in the book seems more appealing at this point. The techniques used with silk thread and with cotton thread are not necessarily that much different, so, to make a marked difference between the approaches, I envision using a similar design, and incorporating some real metal threads. So that’s the direction I’m contemplating at this point. You’ll still get a good idea of what can be done with the project – or similar projects – using whitework techniques and using silk threads (with some metal threads, too), and yet, there will be enough of a difference to keep interest alive, and the projects will pared down enough that they will be manageable for me and will extricate me from the deadly grip of the SOS monster. Speaking of the silk version… remember when I showed you my silk thread organization for Silk Mill threads? The reason I plan to use predominantly Silk Mill threads is that they are filament silks, and they come in a huge range of colors. And now they come in more colors! 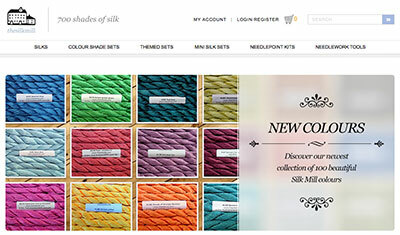 They’ve added 100 new colors to the Silk Mill thread line recently. 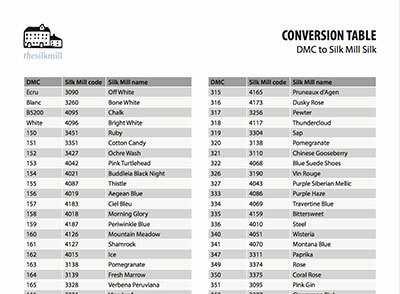 And to make selecting colors a little easier, they’ve added this Silk Mill – DMC Thread Conversion Chart to their website. It’s a handy PDF and worth printing out, if you’re considering using Silk Mill threads for any projects. No thread conversion chart is 100%, absolutely accurate, but it’s nice to have one available that can at least act as a guide for color selection. A long road trip gives a person ample thinking time. One thing I concluded at the end of this last driving venture was that I need to be a little more realistic in my goals for website projects this year, if I want to accomplish anything else along the way! So, I hope you’ll continue following along with the current Secret Garden project – I’ll be moving onto the birds soon – and that you’ll still enjoy (and learn from) the reduced approaches for the whitework and silk versions. I promise I won’t tell anyone your secret and I’m so glad you have chosen me to confide in I feel very privileged ha, ha! it’s good to get things off your chest especially confessions I am similar when it comes to projects the SOS applies to me as well. 2,500 miles is a Iot of thinking, I can’t wait for the alaphbet e-book, are you contemplating starting an on-line class in the near future oh great when? The different versions of the Secret Garden project sound much more manageable and just as interesting and I’m sure you will have loads of different stitch techniques included. I can’t believe the Silk Mill has added another 100 colours wonderful, Oh I just love chart conversions it makes stitching with different threads so much easier. Thanks Mary for sharing your secrets and I hope you feel better for the confessions. Hi Mary, I totally sympathise – I suffer very badly indeed from SOS. Perhaps we should form SOS Anonymous? In fact, if I’m REALLY honest … I think I actually prefer thinking about the projects to doing them. Now that really IS a shocking admission! Anne, I will share your confession for thinking about/planning over actually doing! I have always felt like such a loser for that, with my critical self-talk running along the lines of, “You’re not really an embroiderer, you just wish you were, you poseur” etc….. I share your deep dark secret Mary – I also have the “SOS” syndrome. . . .sigh. . . what to do??? LOL! I don’t know about the rest of you reading this blog but I think many, many of us suffer from the SOS problem. As women, I think it’s endemic! When I look at the number of projects waiting in my stash it is completely mind-boggling. When did I ever think I was going to have time to do them? Was I planning to live to be 150 with my faculties and fingers still working? But there is something to be said about that positive attitude. And if life and failing body parts didn’t get in the way just think of how much we could accomplish! OK, it’s our secret. I am happy to hear that I am not alone. And it’s not just stitching or quilting projects. Either I am not a good time manager or, like you, under estimate the needs of a project or my capabilities. It can be very humbling! I love monograms and looking forward to the letter H.
Thanks for all your wonderful site. I love it! I am so glad that someone else has SOS, also. My mother keeps telling me I should finish what I have started, but I tell her my brain does not stop coming up with new projects. You have such wonderful ideas that I have to add those to my list as well. Look forward to white work and silk projects. White work is going to be one of my next techniques to learn. At present I am working on black work and am enjoying it tremendously. I am really excited about the white work idea. You have written about different white work styles but cant find that you have done a project. I love both the look and doing pulled,drawn,cut and needleweaving. I often wonder when some color can be introduced with out losing the airy effect that these techniques produce. Hi Mary I think probably I have the S O S although mine is more on the lines of L O S (Life Optimism Syndrome). I find my mouth promising things that my brain really knows it cannot achieve in the timescale that it thinks it can. If you find a cure let me know please! LOL! Yes, I think I do the same thing! I’m not sure if there’s a cure. But I do find that the busier a person is, the more a person gets done, as long as the person is organized. And when I fall apart, organization-wise, or get off schedule – or when I think I have “more” time because I’m not pushing a particular deadline – I get a lot less done. So they key, I think, is keeping to a daily schedule of some sort. SOS and LOS and OCD! OMG! I must confess, I too am a victim of SOS. I think that anyone who picks up a needle and tread is subject to this affliction. Thank you for your honesty and encouragement—-we can fight this together! I think that sounds like a wise decision. That is a BIG project. Will you be using the same ground fabric for all? I wonder if others suffer from the “sick syndrome”? if i don’t feel well, I think, ” I will just stitch today.” But I don’t. Stitching requires feeling good, or so it seems. You’re right, Jean! I can’t stitch when I’m not well. Or, if I do, it has to be on something completely “easy” – no effort of concentration, no difficulty with detail or anything like that. Generally, though, if I’m not feeling well, stitching is the last thing on my list of things to do. SOS? Oh yes. If I never get any new ideas, I will probably need another 30 years to accomplish my dreams. Luckily some fall by the wayside as new ones arise. What a relief! I thought I was the only optimist/design-by-thought/buy-all-the-materials-then-lose-interest/etc. person out there. I have a plethora of projects framed up and partially completed because I tend to do this on a regular basis. It wasn’t until I reached a certain age and realized I WILL have to live to be 134 with perfect health, eyesight and faculties, to finish the projects waiting for me (in my storage locker…said in a lowered and shame-filled voice). But, hey, at least they are beautifully organized in neatly stacked Container Store bins! Thank you, Mary, for allowing me to confess but, perhaps, I should have signed my name “anonymous”. Oh Denise: I’ve even made the mistake of buying kits, panels and fabric I “just had to HAVE” for when I retired. You know – something to keep me busy. Ha, ha. Yes, I have storage boxes too – and I’m still working!! Hello. My name is “bobbi” and I suffer with S.O.S.! I think it is responsible for the mass quantities of “stash” I live with! oh well. Hello Fellow Travelers!! Yes, I think there is a direct correlation between SOS and Stash Accumulation Syndrome (or SAS)! Mums the word – your secret is safe with us. Your different options for whitework and silk sound really interesting. Can’t wait to see what you will be doing. Good Morning Mary. I certainly understand your “SOS” predicament. What stitcher would not? 🙂 I do have a question for you and it is off this subject and I am sorry if I should not post it here. Just delete or move it if needed. My question…What is the difference between “surface embroidery” and “Crewel embroidery”. I am brand new to this type of needlework, being a cross stitcher, and I have ordered quite a few books in the last few days but I can’t seem to find the answer. Or, maybe I have and just don’t realize it. “Surface embroidery” is an umbrella term for embroidery that doesn’t rely on stitching on a grid. Crewel embroidery is a kind of surface embroidery. But “crewel” implies the use of crewel wool or tapestry wool for the stitching fibers. Today, it is quite common to see crewel embroidery designs worked in fibers other than wool, using the stitches typical of crewel work, but strictly speaking, when that happens, they are no longer producing “crewel embroidery,” but surface embroidery. Traditional crewel embroidery (worked in wool) has always sported a variety of stitches, but it’s a somewhat limited variety – long & short stitch, stem stitch, split stitch, various lattice fillings, French knots, chain stitch, and other common, basic stitches. Today, many designers expand the stitch varieties in crewel pieces. As long as the wool is there, it’s still crewel work. When there’s no wool involved, it’s really just surface embroidery. Another point of confusion is the notion of “Jacobean” embroidery. “Jacobean” is often confused with “crewel embroidery”, but technically, “Jacobean” is just a design style, not a classification of an embroidery technique. Jacobean embroidery designs can be worked in any kind of fiber. If they’re worked in crewel wool, then they’re crewel embroidery. If they’re worked in silk or cotton or what-have-you, then they’re really just surface embroidery on a design that happens to have a Jacobean flavor. Ha! It’s nice to know you are human! From one fellow SOS to another…hang in there! The revamping idea is great…look forward to your modified plan…whenever you get around to it. Gosh, to know that it has a name! (lol) Yes, I do admit, I’ve probably got at least a wee bit of SOS in me. Okay probably more than a wee bit. But, anyway, I totally comprehend you. It strikes me more often than I’d like to admit, too. I am very excited about the hummingbirds. . .Can’t wait to see what kinds of ideas you’ve been coming up with! Mary, I fall into the same syndrome with my projects. I get up in the morning thinking I have a day to work on something and then the wheels fall off as phones, drop-ins and chores take over. Like you I like to think about my projects and how I will proceed which for me is half the fun. I am not a victim of SOS! Does this get me kicked out of the club? With my Cerebral Palsy I go in thinking it’ll never get done so I’m always shocked when I finish! Oh, Mrs. Corbet whenever you start talking silk I just moan with longing. BTW I just received a gift of several spools of Pearl Cotton thread, I can’t wait to try it! Any Tips? For a scaled down project in the book I would do the peacock (only the bird) in silk, and a whitework of the gazebo! It’s ok, you can still be in the club! With perle cotton, just make sure you use the right size needle – which always ends up being (for me) a size larger than I originally think. Thank you for the tip, and for keeping me in the club! I do tend to be very optimistic about the amount of thread I’ll need for a project, and consequently always end up needing MUCH MORE! Do we have a name for that? Mary, I can certainly appreciate your thoughts and feelings on this issue; however, isn’t this the case with any type of project? It seems that any project costs two to three times greater and takes three to four times longer than originally anticipated. Alas, it is the way of life. Not only is this true with needlework projects but have you ever been involved in a kitchen or bathroom overhaul? I applaud you in your candidness and honesty regarding this dilemma because I have found myself in exactly the same position many times but that is the beauty and charm of needlework for me as I have come to see it as an adventure. I’ve started with one idea and then switched to a different approach in either scale/size or thread selection. Indeed – house remodeling is an excellent example of the same problem, though on a slightly different scale! Yes, SOS, is a very infectious condition. There just aren’t enough hours in the day! I’ve been waiting for the silk version…I had other commitments when the cotton version was worked. I completely endorse the inclusion of other threads, new stitches and even a different pattern. I’m very excited to get started. One question…is there a needlework store, online or brick and mortar the carries the mill silks? I am waiting patiently!! for the birds, can’t wait! can I ask Mary, are embroideries done with two or three or more strands durable or the stiches start look clumsy uneven and not good enough? Hi, M – it totally depends on what you are embroidering. Some projects just require a heavier line or a denser filling, and using two or more strands accomplishes that. If the design requires that chunky appearance from heavier threads (say, three or four – two strands is pretty much standard for a lot of embroidery) then the only way to really get that look is to either use a heavier thread altogether (like a perle cotton) or to use multiple strands of floss. So it really depends on the look you’re after! Mother Milla, I surely can relate to what you’re saying. it is good to know that our mentor is just like us. I often dream of new ideas and most do not get past the dream or the sketch. Thank you for your honesty and your continual work in embroidery. I LOVE your emails. I sympathize and relate to SOS. It’s nice to have a handle for the condition. I do a lot of sewing of all types and it is a ministry to others and therapeutic for me. My confession is that I have always thought I’d learn embroidery and found your web site so I could begin to learn BUT I have grown wiser and decided that I will continue to enjoy all the other embroiders and stick to my busy sewing projects. I do love your blog and I visit it everyday to learn to appreciate what you do so well. I have been impressed with all you do. It makes me feel a bit better knowing that I am not the only one that gets snowed under. I am not stitching your project as I have several others in the process but I love following along. Take as long as it takes and don’t feel guilty. I enjoy reading your progress and ideas and follow you every day. Your work is wonderful and inspirational. Oh my heavens! You must be me!! You poor thing — it’s a terrible syndrome to have. I know well from hard experience myself. If I find a cure, I’ll share and I trust that you will, too, if you find the magic elixir. I’m sooo glad you admitted to having SOS, I don’t feel so alone. Of course if I’m honest, it doesn’t just affect my embroidery, it affects everything in my life. Oh well, at least I’m an optimist! Greetings Mary, I agree with you in your handling of the Secret Garden Hummingbird project. I wondered how you were going to get everything done and thought briefly you must be akin to “super woman” to even attempt it all. I am still working on the leaves and making good progress. Then, I want to see what you do with the birds and the flowers in the silk and regular version before I do mine. Best of luck and thank you so much for all your help and patterns and project SALS. I think you are pretty amazing with all you do. Mary, we are just watching you with love and admiration as you accomplish so much! Dreaming big is not a weakness! Too many people let Real Life (car repair, dental visits, shopping, laundry, bathing, meals, crew rest, etc.) take up all their time! They fritter the remainder with TV, newspaper, jigsaws and crosswords! Being retired, I still want it all now! And it just is not happening! I plan so big and even when there’s time, my energy drops; I get tired enough to cry or otherwise lose momentum. . . . I’d love to have just a little motif on a pocket, pillow top, or bookmark! My dolls are asking for tiny flowers or tambour embroidered curlicues on their aprons. Well, you now know that you are far from the only person with this stitchers’ ailment. Many years ago, I remember seeing a cross-stitch sampler with the motto: Don’t start Vast Projects with Half-Vast Ideas. I always thought that one was written just for me! As someone who isn’t intending do the Secret Garden project, I am relieved by your decision. I am enjoying following the present piece, but two more of a similar size would make for rather boring reading, even in different techniques. Both whitework and silk embroidery suit small projects where you can appreciate the fine, delicate details. The scale of this first piece is perfect for the bright cottons. Sometimes it takes a bit of distance to see our ambitious plans and ideas in perspective. 2,500 miles is a little far to have to go, but it seems to have done the trick. No matter what you end up doing with any of your website projects, your website will still be the best one on the Internet IMHO! Glad you had time to think and reassess. You offer a great service to the worldwide embroidery community. We all have SOS. It doesn’t surprise me at all that you decided to do the silk project with another project in the book. There are so many lovely patterns – I would do the owl, perhaps. I understand completely. It happens to me all the time! I look forward to seeing the whitework and silk embroidery you have decided to do! Well you can tell from the comments that we all seem to not be able to control our own SOS. In my case it is in my stitching, quilting, gardening or photography projects. I tend to think I can do so much more than is humanly possible. Even though I have wisely, after many decades of ufos, started to get more done that started it is only because I don’t start so many since there are so many in the ufo pile! This project is looking so nice and I venture to admit that part of the reason I love reading your blog is that I can watch your project while finishing an old one of mine ; ) Thanks! I, too, have SOS – only it attacks me at Christmas time. I get all these wonderful ideas, get everything ready to make, and then there isn’t enough time. BUT!!! This site has inspired me this year, and I’m already stitching away, determined to stay ahead of this Syndrome!!! Stay strong and focused! I would like to suggest you do the silk version of the page with the peacock. I think it would be beautiful in silk and there are a variety of places gold work could be done, including making a circle around the outside, so it would fit in a circle frame. Another suggestion would be to do the fish: think koi fish with sunlight glinting off the water and one side of the upper and lower plants. Mary, I can’t imagine doing a project as complex as this more than once, let alone THREE times! OMG. I also have SOS along with my OCD. I will look to see where you explain about filament silks. Thank you, thank you. I am so going to order some of the Silk Mill threads they look lovely. Thanks for everything you do Mary I’ve learned so much from your site. Well I for one appreciate your honesty. lol That’s not always the case in blogland I think we’ve all discovered. One thing I started doing is having 3 or 4 different needle projects going at the same time. I have different moods on different days for different things (ahem) so this helps me stay attentive and enjoy the process much more than the long gone regemented approach of “finish one project at a time” syndrome…. Glad you got a chance at a road trip and glad it gave you time to think. We “fulltimed” in an RV for 14 years and I still underestimate the time it will take for me to do a project! Your alternative are really pretty good. Thank you so much for pointing me/all of us to Luzine Happel’s work and books on Schwalm Whitework. I have a new love! I ordered two of her books from her site and through Hedgehog (again because of your direction) the threads and ground fabric and am eager to start my first project! I just love whitework in all forms, and I have you to thank for introducing it to me! Many thanks Mary. Secret Garden in silk and metal threads – oooo, yes please! Mary, I am actually relieved that you are doing somewhat different and scaled down projects for the white work and silk versions. I was getting stressed for you, just thinking about you doing that complex design 3 times! I know you will select equally lovely designs for the other 2 projects and you, and we, will continue to be interested because of the change of design. I have worked to rethink my approach to my embroidery projects! I used to buy every kit that appealed to me thinking I’d get to them and finish them one by one. Soon I was so overwhelmed I quit embroidering all together for several years. When I started following Needle n’ Thread my interest was renewed but this time I purposely limit myself to one kit at a time. I like kits because everything is there that I need. that makes me comfortable. Now I love embroidering again and I don’t fret if I take my time finishing it. I enjoy every stitch. My current project, Cardinals in Dogwood, has been a source of enjoyment since January of this year. I look forward to my next project which will be learning to needle paint. Thank you SO much for your newsletters and your website. So, have silk mill changed their threads? I had samples a few years ago and their silks were like anchor stranded, a twisted silk thread, whereas to me filament is a flat untwisted silk, and the stuff on your sampler looks twisted too. Hi, Tanya – it’s a very softly twisted filament silk. It is twisted, but it’s not a tight twist like buttonhole silk, etc. Dear Mary…please do whatever you need to remain sane and capable of giving us..your devoted followers…our embroidery fix. I do look forward to hearing from you but would hate to feel that you were under pressure to do so. I don’t mind what you feed me….I love it all. Thank you so much for investing so much time and energy….you may not always see the results but they are out there. I wish my over-optimism were confined to stitching. I think I have what may more accurately be Project Optimism Syndrome, as it also covers sewing, quilting, crafting, decorating, cooking, gardening, art…. I will say though that I try to maintain just a list of ideas or at most acquire the books or instructions/plans. I’ve learned some supplies don’t last well (paints, glues, and as we’ve recently learned – some threads). MARY!I think I’ve got SOS too! And it applies to all factors in my life—-is there a cure do you think? Enjoy your blog so much, it’s one of the highlights of my life. Dear Mary, You said it so right, it’s good to hear a professional say that they tend to be over optimistic about their projects and time and what they are capable of. You’ve given me a bit more confidence. I wrote in my journal at the beginning of the year, full of hope and enthusiasm and optimism, all about what I planned to achieve this year. Now we’re at the end of June and people are talking about projects for Christmas. Oh help, now what do I do. I need a long drive like you had to sort it all out. My hubby is home all the time, so there is no quiet time to reassess it all. You are so right. The SOS monster is a monster indeed but I for one am grateful it has you firmly in its grip. If it did not there would be so much less that you could show us. Being a newcomer to your site I’m delighted with all that I see and take great pleasure in seeing it. Thank you so much. I hope your trip is providing fun and sun as well as thinking time. Your secret – what secret? – is safe with me too, and the other thousands of people who read your blog daily. I confess I did wonder why you would want to repeat the same project over and over. I’m sure people would get the message just as well if you did a different (smaller?) project using silk and also for whitework. I would at any rate. I will be happy when the birds bits are done and dusted, my ornithophobia is taking a bit of a beating with this project and although I read the words I don’t always look at the piccies. Not often that happens, I guess. SOS, eh? Is it possible to have it and a knitterly version as well. Oh, and what’s the cure? I am so glad to read that I am not the only one with this problem. Argh. But if we weren’t optimistic, would we even start half the time? Maybe sometimes it’s better not to know.